This episode, Epic Tomatoes was inspired by Craig LeHoullier’s book Epic Tomatoes: How to Select and Grow the Best Varieties of All Time. For anyone who loves growing heirloom tomatoes, and the stories behind them, this is a must-read book for sure and a great addition to your own, or anyone’s library for that matter. Craig LeHoullier and GGW crew taking a short break between filming on our first visit to Craig’s driveway garden in late April 2016. While Craig has rocketed to rockstar status in the international tomato growing scene in recent years, his decades of experience quietly growing, studying, and breeding them has made him one of the most in-demand speakers and authorities on the gardening scene today. 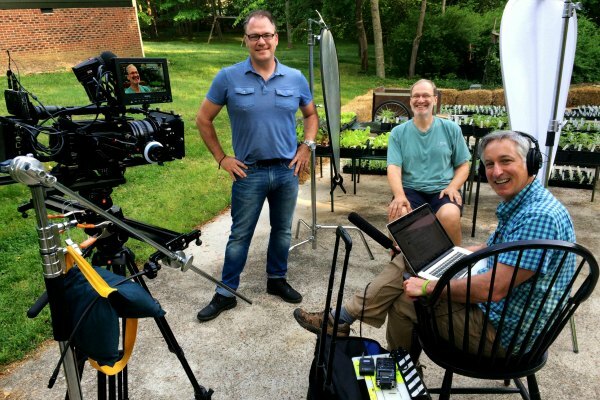 This episode is unique for us because we traveled back to Craig’s NC garden 3 separate times to catch his garden at different phases: beginning, middle, and end. Craig’s processes for what he does with tomatoes is fascinating, from the time he starts his seed sowing in February, through his seed saving in mid-summer and beyond. He records just about everything he does and refers back to it often while continuing to pioneer new growing methods and varieties to openly share with the public. And while there are countless successful tomato growers out there, few if any grow as many as Craig in such a small and non-traditional space and way. And that’s where the story is. That, and his journey of discovery and his passion for the tomato — past, present, and future. As Craig will quickly tell you, he never set out to have so many spotlights shining on him for his expertise of America’s favorite fruit. In Craig’s words; “the tomato chose him”. We are so glad for that! Craig LeHoullier’s website – A great resource for all things tomato. He’s also a great writer. This blog is just fun to follow and read. Craig LeHoullier’s book, Epic Tomatoes. In the words of Joe Lamp’l; “This is my all-time favorite book on tomatoes, and frankly one of my all time favorite books period”. If you want to know Craig’s way for growing tomatoes, as well as the fascinating stories behind some of the most popular (and nearly forgotten) heirlooms, this book will not disappoint. Craig’s list of favorite heirloom varieties and where to buy the seeds. Disclosure: The book links on this page are affiliate links which means we would get a commission if you purchase it through this link. However, none of the prices of these resources have been increased to compensate us. While the commissions are small, any received go towards helping to offset the expenses of bringing this free content to you. Thank you. Suggestions for South Central Texas tomatoe varities….Go! Great video. This year I grew 26 of the dwarf varieties. Most of them did great. It’s a wonderful way to get new gardeners interested considering the small amount of space they need. Good show guys. What are your thoughts on using Mushroom Compost for growing tomatoes? Here in Richmond VA, I have a supplier that sells it. I think a big advantage of Mushroom compost is that it won’t contain any herbicides. Chris, amending the soil you plan to grow your tomatoes in with compost (mushroom or other types) is a good idea provided you have a reliable source (doesn’t contain any residual herbicide) and you don’t use too much. Here’s a link for a post I wrote that addresses using compost to grow tomatoes https://www.growingagreenerworld.com/tips-for-growing-great-tomatoes-starting-off-right/. Craig may have more to say on this. To contact him directly, visit his website at http://www.craiglehoullier.com/. Have a great tomato growing season and harvest! Love the tomato shows. Does Craig use the same mixture of the cow manure and potting soil for his seed starting soil? Thank you! James, We include show notes for every episode of Growing A Greener World. As part of this we provide links and in the case with Craig LeHoullier we direct you to his website and book. For the podcasts on joegardener.com we have a blog post to go with every podcast. I hope this helps. Here’s a link for episode 803 https://www.growingagreenerworld.com/episode-803-epic-tomatoes/. Happy gardening! I’m with James, though. It would be so wonderful I have a transcript like Margaret Roach does. That way if you just want to check one little fact you don’t have to invest another whole ep minutes in either registering or searching and searching through the links. CrewMom, Thanks for your feedback. Although there is not a transcript for each podcast, there is a comprehensive blog post which we provide and hope is useful. Thanks for listening. Have a great season in your garden. I just listened to the podcasts on seed starting. I love them. And I am very anxious to see how he transplants those tightly planted little seedlings. You mentioned that it is on the website, JoeGardener, great website as is this one, but I cannot find it! Winter here in Maryalnd was bitterly cold in January, I was grumbling under my breath every time I went out to feed the chickens or change their water. I finally realized I had a better way to fight back – I planted seeds! Early, I know, but with me it is usually late. And it sure was nice to come in from the cold and see those little shoots of spring. I will be planting more, and want to try the method you talked about. Thank you. Sorry, Joe. I see that it is actually IN this GAGW episode. Sorry I didn’t realize that right away. Great to see this and learn this. Thank you! Suzanne, Glad you found the information you needed. In case you didn’t realize it we have show notes to go with each episode of Growing a Greener World. These are on our GGW website. I went to college in Maryland and am glad to have Georgia winters now. Have a great year in the garden! Please warn please warn people not to use straw bales unless they are certified organic. Rare. Most straw is heavy with toxic pesticides, POP, round up, etc. This will bring in horrible weeds and toxic compost. I had pig weeds that had thrones so big I had to have two surgically removed. The thorns are like rose bush thorns. Round up is sprayed on wheat, oats,etc to dedicate them right before harvest. I love your videos. They are informative and well done. Thanks for your comments about straw bales. It’s good advice and this applies to mulches and compost too. That’s the great thing about making your own compost, you control what you put into the compost. So sorry about the thorns! I hope you have a great garden in 2018. Have you started any seeds yet? Very informative. Thanks for doing this. One thing I did not see: How does Mr. LeHouillier deal with tomato hornworms? The camera did not show any stems that had been stripped of their leaves, or fruits partially eaten on the vine by these bugs. Is there information about it in his book? Happy gardening! Don’t forget to be careful around the hornworms, they sting! I use Thuricide, no more problem with caterpillars, it’s the only thing I spray on my plants anymore. For diseases, I prune. Love this episode on tomatoes! My favorite food! I agree about background music – too loud. Martha Stewart is the ONLY instructional tv show WITHOUT background music and it’s an A+ viewing experience. VIEWERS WATCH these shows for information/education! We do not need musical accompaniment! Whoever thought we need music behind everything is WRONG! music and will discuss it with our team. Happy Fall! Last night my wife and I attended a talk by Craig at a library in Raleigh, NC. What a wonderful person with such a cheerful personality. He personally greeted everybody who attended and gave us all different packets of tomato seeds. Very informative talk with lots of information and encouragement to grow our own plants. Also, gave us his e-mail address and said to ask all the questions we wanted. I can’t wait until the start of next years growing season. Thanks for airing such wonderful and educational shows such as this. Keep up the good work! Great episode, I am rethinking how I will garden in the future. This would eliminate problems I am having with gophers! I am really impressed. Hi Joe, great episode. This year was my first time planting tomatoes and I know I will do better next time. I have gained knowledge from your show. I have been reading the comments and can’t find the website to but the bags for planting. Thanks Phillipa. I appreciate your comments. I did not provide a specific website for the grow bags so please do an online search for these using the term “5 gallon grow bags” or similar. Here in the heartland of NJ home of Rutgers tomatoes and terrific experimentation I became a big fan of Cherokee Purple and heirloom tomatoes. If only I had Craig’s discipline and a friend like Brie who would inspire me and invite me to the Tonato party. Outstanding episode! How many tomato plants does he put in the straw bale , we taped the show but there isn’t anything saying how many??? 2 is a good number Sandy. Awesome episode! Great program notes as well. We noticed Craig spreading something on his bales after he watered them. Was it fertilizer? If it was seeds, he sure grew a lot of them. Thanks, great show and we’re going to give both a try. Hi Laurie. That was a nitrogen based fertilizer to start breaking down the bales so they would be more soil-like in the area where he was going to plant the tomatoes. How about doing an entire show JUST on growing tomatoes in straw bales? What works. What doesn’t. It seems like a perfect way to avoid the plague of soil-bourne diseases in tomatoes– especially in wet, rainy summers. Here in the N.E., it is so difficult to ripen long-season, heirloom tomatoes organically without being blasted with diseases. It’s a huge problem even when practicing careful rotation. I love the portability also of growing in straw bales. Wonderful show. Thanks. Hi, Mary. I think this idea has merit and worth looking into. We have a team-wide planning meeting coming up later this month and this will be a good topic to discuss regarding future content/shows. Thanks for your message! I would love to be able to turn off the background music. It’s way too loud and distracting. These shows are great otherwise. Hi Besty. What episode or episodes are you referring to? It would really help to know what you were watching to cause you to send this comment. We had a number of people comment about the background music but that was from our first season. However, that season is currently airing in various parts of the country. So, I”m hoping this is one of the shows that led to your comment here. We’ve been working every since on bringing down the background music to a happy compromise. Please let me know if you can provide any more information on what the subject was when you were watching with the background music. Thank you! What a beautiful episode! Love how you told Craig’s story. Look forward to watching more episodes. He offers so many wonderful tips for successful tomatoes! He has a beautiful garden as well. Loved listening to why he was inspired to garden. It’s amazing how gardening builds memories and a strong bond between family, friends and strangers that evolve into friendships. Gardening is so therapeutic and the connection to nature is peaceful there is nothing like being outdoors. I’m up here in PNW where last year tomato plants suffered blight. Learned alot from how blight effects tomato plants. Apparently received too much rain. Hope for success this year. I just planted first determinate, usually I grow indeterminates. Going to keep my eye out for dwarf as we dont have much space. Also the grow bags would come in handy. Thank you again for a beautiful episode! In the part where you were discussing the dwarf tomatoes I didn’t hear any variety names mentioned. Are these available yet as seeds or plants for the public? I love that he does this all in his driveway and the bails of hay! Very inspiring! They are available as seeds and plants, although supplies of both are increasing every year. You may want to search online for where to buy them, or check out Craig’s website where I suspect you can find out or contact him for more info there: http://www.craiglehoullier.com. My son secured a copy of Epic Tomatoes for me last year and I met Craig this past weekend. Through that connection I found out about Growing A Greener World. Great episode and I look forward to reviewing many more. I hope the show will air in the Atlanta market in the future. Thanks to you all for making us better gardeners! You and me both John! Living and filming many segments and episodes of our show in and around Atlanta, but not being supported here by either of the stations is really frustrating! Both station program directors need to hear from more of their viewers that they want Growing a Greener World to be featured on their station. We’ll get there but hopefully sooner then later! Thanks for your note. Now I know what I did wrong putting in my tomato seedlings. Oh well, I’ll start again. Thanks for another great episode. 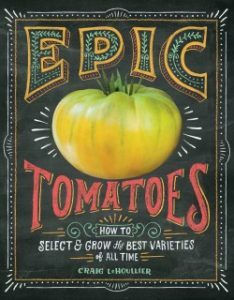 Where can I get an autographed copy of “Epic Tomatoes”? Wondeful episode. I will like to obtain the grow bags. Thanks for the information. Just want to put my two cents worth in – working with Joe and Carl was simply outstanding – fun, thoughtful, thorough and so professional. There are so many fun impressions of their visits – endless bird calls, sufficient heat and humidity, mostly cooperative plants…watermelon…coffee…a chipper shredder….mostly, really really fun. Please, all – ask any questions that come to mind! I will be blogging my season as usual – at craiglehoullier.com – questions that are asked here will be answered – email me at nctomatoman@gmail.com if you wish (I track all questions to ensure they get answered). Mostly – grow great – EPIC – tomatoes! Awesome Craig. Thank you for making yourself available here. Brace yourself. I’m sure there will be many questions and comments. And many thanks for providing such a wonderful platform for this episode. We have all loved our time working with your and preparing for this show. May the fun continue. Cheers my friend! Craig, thank you for the generous offer, have a quick question for you: when you were separating and planting the seedlings to the 3.5″ containers, you sunk them pretty deep, up to their leaves. How big are the plants, and how deep do you bury them, when transferring from the 3.5’s to the 5 gal grow bags? After checking around, will probably just go with the standard 1/2 to 2/3’s plant depth. Will also have to find a different potting mix recipe as the master gardener at my local garden center steered me away from their cow manure ‘too hot’ and ‘known to have heavy concentrations of salt’. Other box stores only supply mixes (manure and redwood sawdust, etc). I vermicompost, so will try that as a possible substitute. Hi, Greg…I’ve been using Black Kow mixed with potting mix here in hot central NC for my container-grown tomatoes for years with awesome results. Hi Wendy, thanks but unfortunately, Black Kow isn’t available here in Southern California (except on Craigslist for $80 a bag). With the results you and Craig have with the mix, and I’ve seen Joe talk favorably about BK elsewhere, I spent a good deal of time looking for it; and with what’s available locally, I just don’t have enough experience/confidence in it to trust it’s the same quality. Tried Cherokee Purple two, maybe three years ago, and unfortunately lost all the fruit to blossom end rot. Totally my fault as I was a ‘plant seed in dirt, water, feed with miracle grow’ type of gardener. Didn’t know anything about anything. With the resources here, what I’ve been learning at my local garden center, and info on Craig’s site will have to try again. Just really, really want to see what they taste like. All the more after Craig’s comment at the close. Did want to ask, are all grow bags created equal? I did a search and it seems there are different weights (mils) holes and colors (white/black/burlap) I just want what works. Wanted to post a quick follow-up. After considerable time looking online, finally asked Craig about the grow bags and he told me where he bought his.. It was such a minor thing and he kindly answered. Anyway, great episode. Thanks for all! Excellent episode…thanks, Joe and crew! Watching it in late April has inspired me to add more “space” to what I thought was a limited-space garden as well as to include more varieties of tomatoes this year. I would write more, but I’m headed out to find some straw bales and ‘Cherokee Purple’ plants…and maybe a ‘Brandywine’ or two…and a ‘German Johnson’…and a ‘Mr. Stripey’…and…and…and. Ooh, I can almost taste August now! What a fantastic epic as my mouth is watering for that Summer taste of a tomato here in SouthEast Ontario, Canada. Craig’s book is a great read, do not miss out. I did not catch the variety of the new dwarf tomato plant? I will recheck his book to see. Also where can one gather the seeds for this dwarf plant? Thank you Joe, Craig, and Brie for a episode full of great information topped with wonderful passion for the tomato. Thanks Walt! Last count I think there about 60 varieties of dwarfs currently available. And the seeds can be saved just as other open-pollinated varieties. Craig may chime in here with other words of wisdom too.